Greenwich is a staggering place. 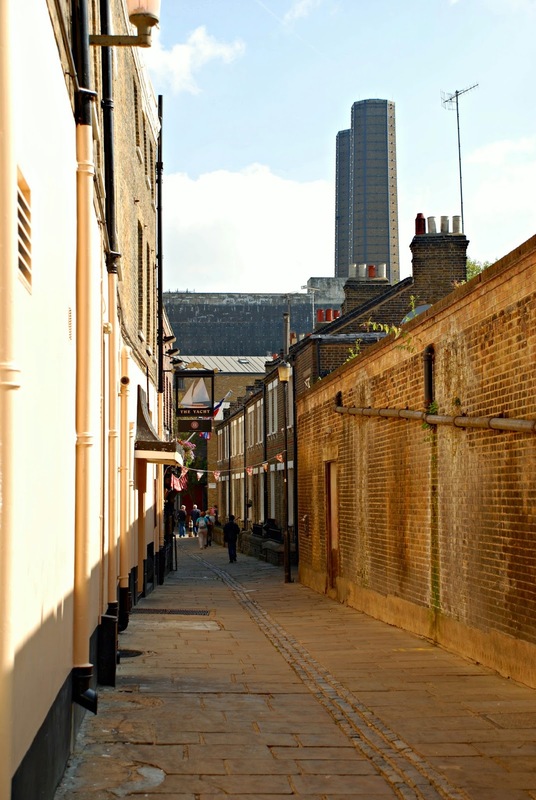 If you come to visit London, you really ought to bend your footsteps down in that direction. There’s just sooooo much to see. Would you like to come and take a stroll around with me and Maxi-the-wonder-dog? 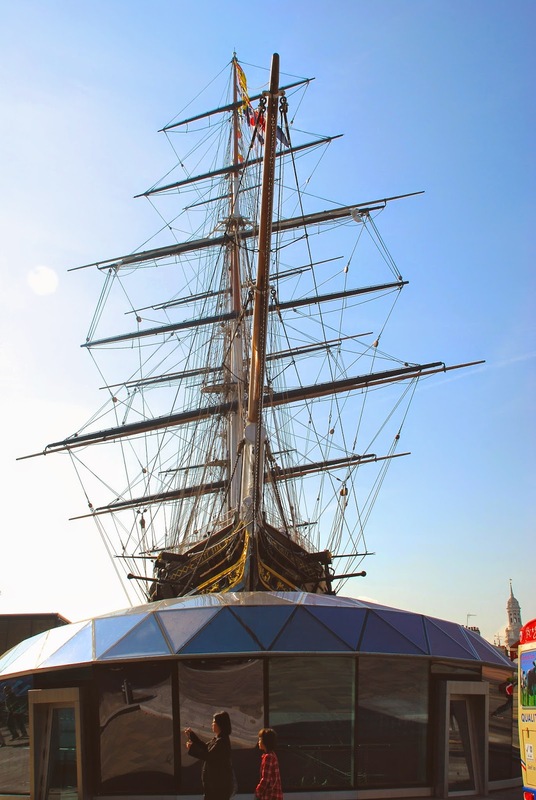 Travel along to the Cutty Sark DLR station, stop, disembark, and follow the signs to go take a look at the most famous tea clipper of them all: the Cutty Sark. I have to say, at the risk of being controversial, that the new visitor centre looks a bit weird ... kind of like the ship got swept out of the river on a great big wave that's left it marooned on the roof of somebody's greenhouse. See what I mean? They've raised the old girl 3 metres off the ground so that you can walk underneath her. Aesthetically speaking, I'm not convinced that this was worth the candle. I much preferred to see her sitting at a normal elevation so that she looked like a proper ship, and you could run around on deck and feel like a sailor rather than a trapeze artist at the circus. Still she's looking good after everything that life's thrown at her. Do you remember how she almost got burnt to a cinder back in 2007? It took them 5 years to get her sorted out after that little disaster, but I have to say hats off to them; they've done her proud. She was launched on Monday, 22nd November 1869 as a tea clipper. Way back then there was race every year to get the first consignment of the new tea crop back to London. Even though I'd hate to spend months of my life cramped up in a floating tea-crate, I'm still a little bit in love with the idea of other people sailing these elegant tea clippers, their sails full of the trade winds, as they raced one another across the seas, laden with aromatic teas from the distant East. Later in her career the Cutty Sark also carried wool from Australia, and in 1885 she set a record passage time of just 73 days from Sydney to London. What an epic voyage that must have been, back in the days when most folk still believed in sea monsters and mermaids. Next stop is the Thames Foot Tunnel. Up ahead there's a curious little building sitting on the river bank that looks like it might have been designed to star-gaze from. 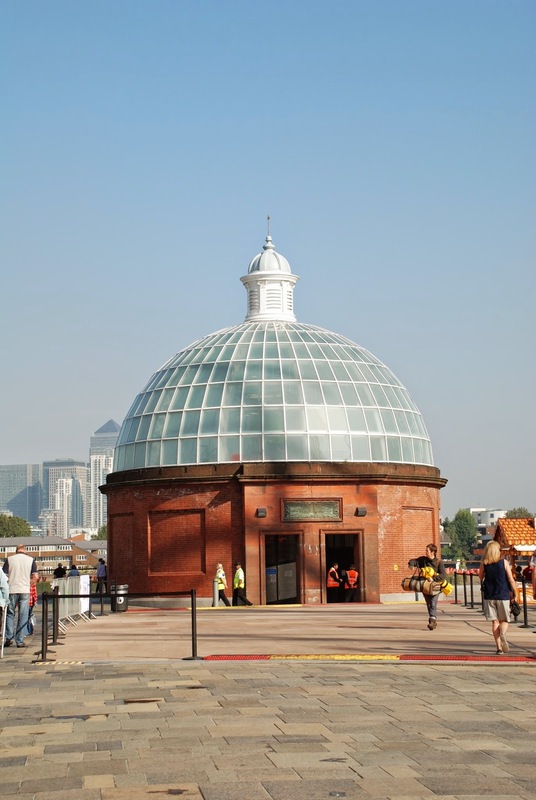 Well it wasn't: that's the entry to the Greenwich foot tunnel, which will take you under the river to emerge on the Isle of Dogs, where you get the very best views of Greenwich. I'm not mad about the tunnel. Don't get me wrong: I think it's a marvellous thing to be able to cross the river without needing to hail a passing ship or go for a swim. It's just that I'm not mad about tunnels, especially tunnels that go under rivers with millions of gallons of water flowing past overhead. Call me weird, but that gives me a serious dose of the heebie jeebies. Maybe if I lived on the Isle of Dogs ... and kept wanting to escape across the river to wonderful Greenwich I'd get used to it. See they've even got a dinky little matching house on the other side to come up in. Anyway, we swing a right on the river bank and hoof along to the old Royal Naval College, pausing at Greenwich pier to cast an eye across the river and admire the lovely boats. I should add that the last day we passed this way they were holding the Tall Ships Festival, so it was even more picturesque than normal. Ah yes, you can keep your dank, smelly tunnels under the river: this is much more my cup of tea. The Tall Ships Festival is held every year. It makes for a great day out with lots of action on the river and lots of stuff happening on shore too. 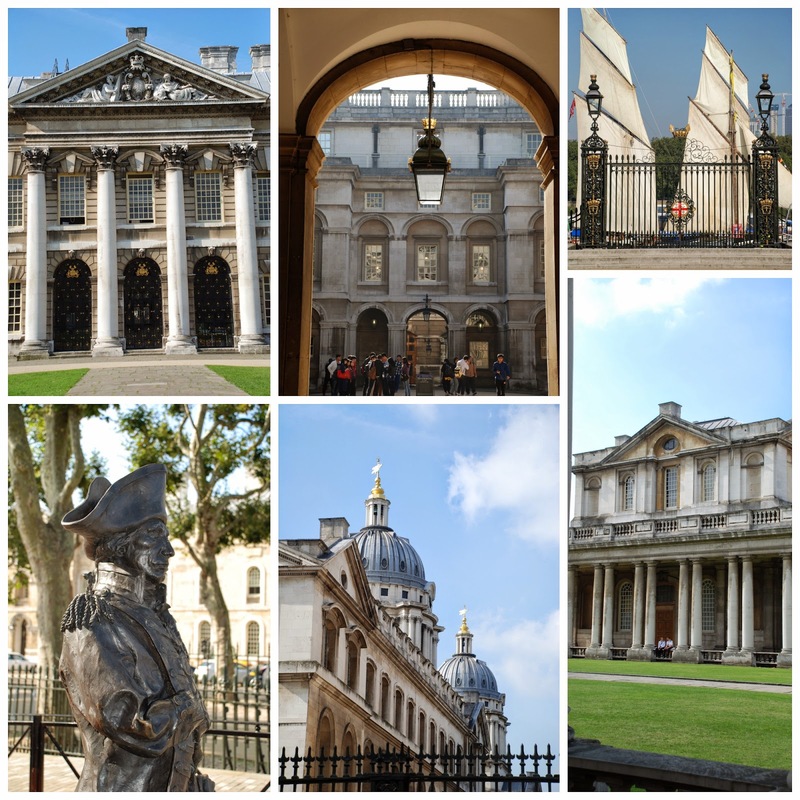 The Old Royal Naval College is hard to miss. Let's put it like this: it's a world-class masterpiece designed by Sir Christopher Wren when he'd got through with designing cathedrals and the like. It opens onto the river and is quite simply splendid. I suggest we take a stroll up through the cloisters and around the enclosed courtyards. It has the feel of one of the better-endowed Oxbridge colleges. These days it acts as the campus for the University of Greenwich. Once upon a time it was the site of Greenwich Palace, where both Henry VIII and Elizabeth I were born. Sadly the old Tudor palace was demolished, bit by bit, to make way for Wren's masterpiece. 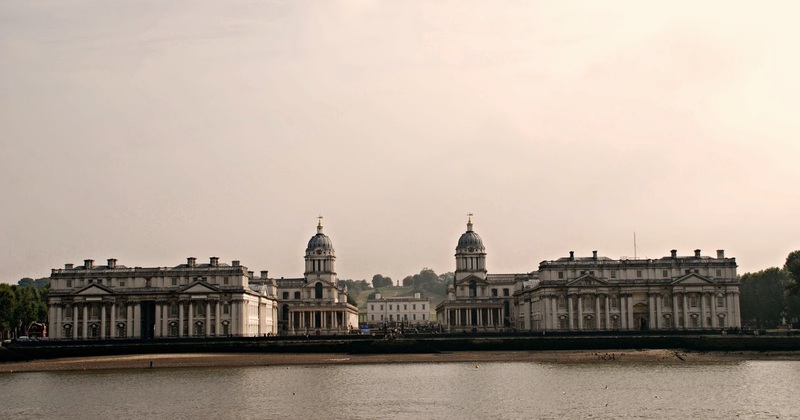 It's a pity they didn't shuffle the Naval College along the river bank a bit, and let both buildings stand. Can you imagine how marvellous that would that have been? 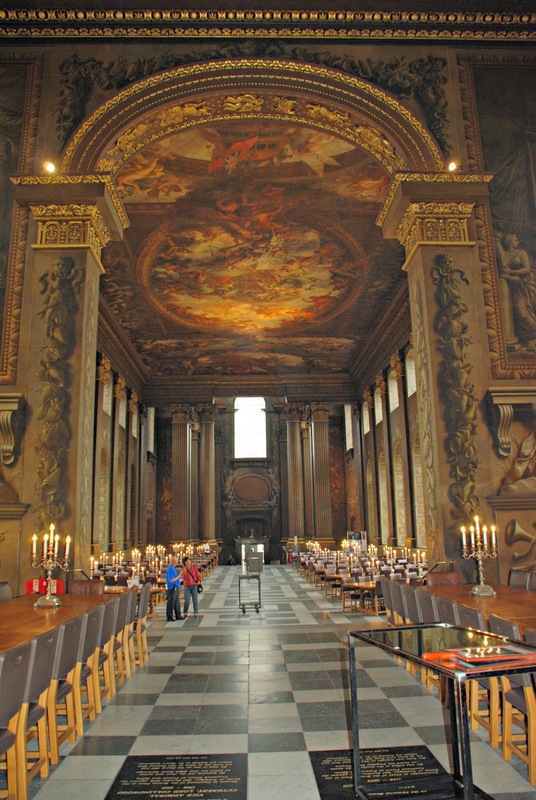 Whilst we're here we really ought to check out the chapel and the sumptuous painted banqueting hall. This is where things can get a bit tricky as the attendants tend to object to Maxi-the-wonder-dog coming inside. So he has to be stealthily smuggled past them in an out-sized handbag. The plan usually works well ... unless and until he's overcome by one of his barky fits ... . Then we tend to get thrown out pretty quickly. The acoustics in these places make a squeaky little mini schnauzer sound like a lion. This delights Maxi-the-wonder-dog, but tends to frighten all the nice tourists upon whom everyone depends for a living, hence our speedy exit. When we stopped by the chapel last time there was a service in progress so we weren't allowed to take photos, which was fair enough. Now we need to walk on down to the river bank again and follow it along to our right (walking away from the Cutty Sark). 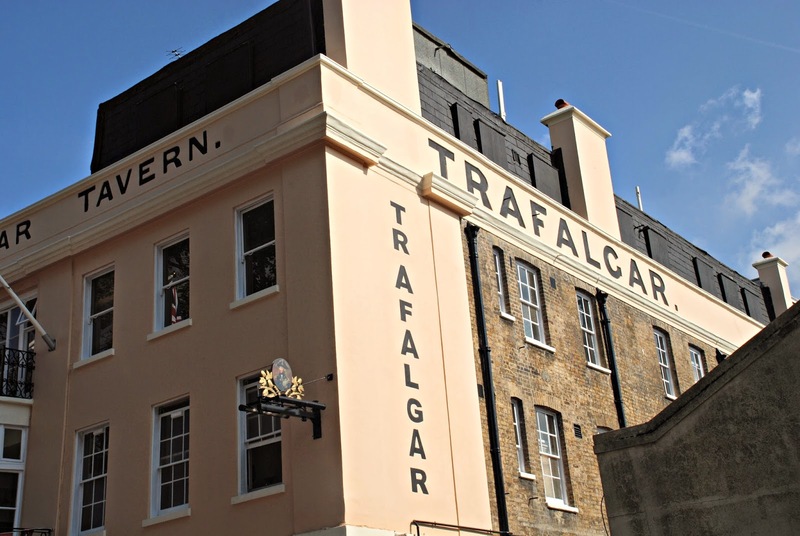 Soon we'll come to a top-notch watering hole called the Trafalgar Tavern, which has been there since the year good Queen Vic ascended the throne (1837). It's got great riverfront views, lovely oak panelling and first-class tucker. Around the back of the Trafalgar we'll find Crane Street, a little street that will lead us back to the river again; we can't walk along in front of the Trafalgar as it faces directly onto the water. There's something about Crane Street. It's a pretty little alleyway that seems lost in time. 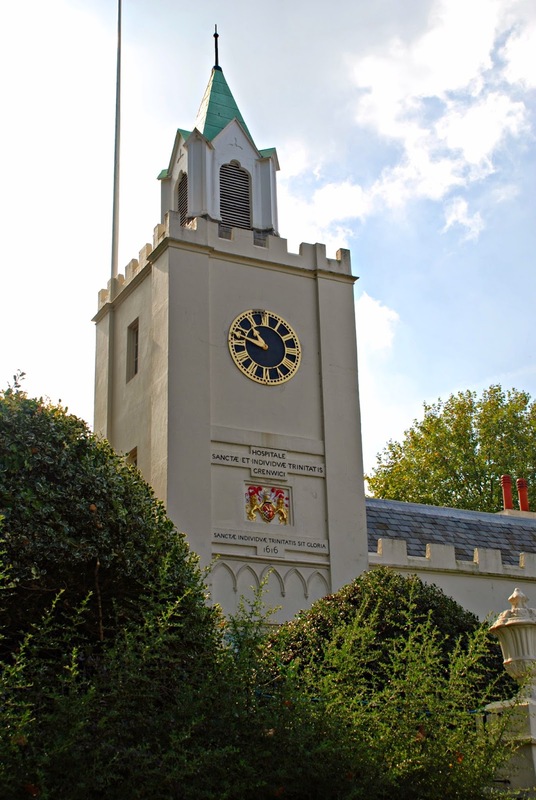 As we emerge we see the power station with the lovely little clock tower of the Trinity Hospital Almshouses nestling in its shadow. 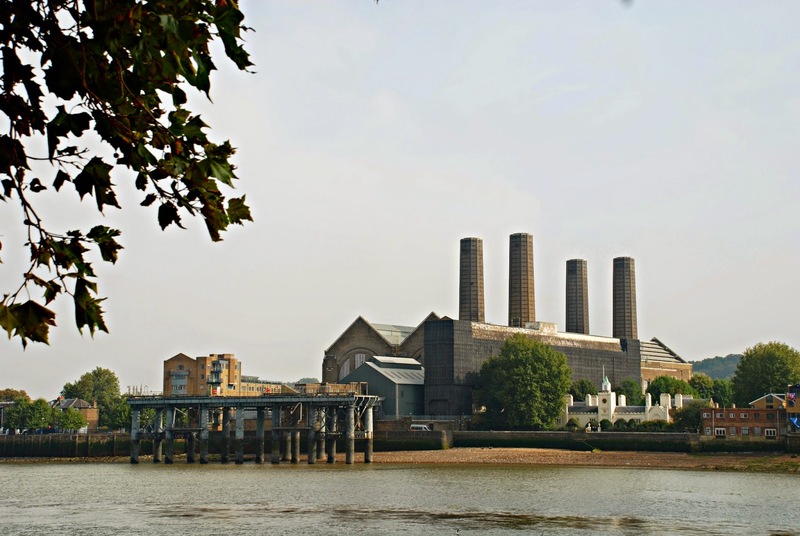 The power station here in Greenwich used to belch out smoke as they burned coal to generate electricity. You can still see the landing jetty where the coal barges discharged their cargoes and hauled away all the tonnes of ash and cinders that were produced. Today the power station is far from obsolete. Despite being over a hundred years old it still operates as a back up power source for the London Underground. These days it burns gas and oil, which is transported by lorry. It's quite a brutal contrast to the elegant lines of the almshouses, but we like to show you the wonderful contrasts that make this great city of ours so vibrant. Now we need to retrace our steps back to the Old Royal Naval College and walk along the side of the building (Park Row) and cross Romney Road, where we turn right and walk along until we see the National Maritime Museum. This is a great place in which to while away several hours, and should be borne in mind as a potential refuge if the heavens open. I suggest we walk off to the side of the museum in the direction of the Queen's House, which sits proudly to the left of the museum with a commanding view directly down to the river across the pavilions of the Old Royal Naval College. This was once the home of Ann of Denmark, wife and Queen Consort of King James I. James is reported to have given the manor of Greenwich to Ann as a making-up present when he needed to grovel and say sorry to her for having sworn at her in public. Poor old Ann apparently shot his favourite hunting dog by accident, which produced a right royal hissy fit and a bit of matrimonial strife. 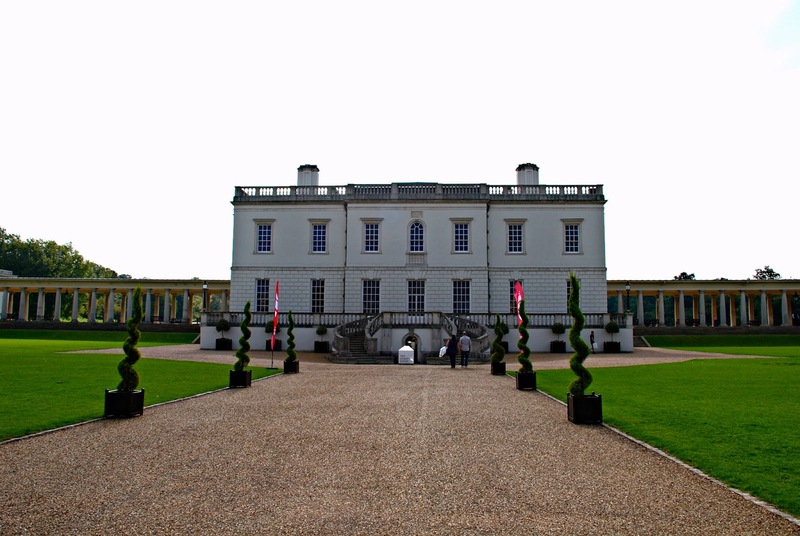 Mollified by the gift, Ann commissioned Inigo Jones to design a little get-away pad, and the Queen's House was built between 1616 and 1619. The old Tudor palace in front was gradually pulled down to make way for the present buildings. When Sir Christopher Wren was given the brief to design the Royal Naval College Queen Mary II stipulated that he must not construct anything that would impede the view from the Queen's House looking down to the river. This is the reason why the Naval College was designed with a large break in the middle of its facade that perfectly frames the Queen's House behind. The colonnades to either side of the Queen's House were added in the early nineteenth century. Today it holds a notable collection of maritime paintings, and is another first-class refuge from the weather should things turn nasty. Of especial note in this regard is its wonderful cafe, where they do very pucker afternoon teas, which are a real challenge/ total disaster for those of us trying to follow a low-carb diet. Now we need to walk round to the back of the Queen's House and enter Greenwich Park. We should cast a glimpse across of the largest ship in a bottle that I've ever seen, which sits just behind the National Maritime Museum. Originally it was exhibited on the fourth plinth in Trafalgar Square. It's by Yinka Shonibare MBE, and the ship inside is a replica of Nelson's flagship, HMS Victory. Now we're going to head up the Avenue towards the Royal Observatory, sitting on the shoulder of Observatory Hill. As you climb the hill the view down to the river just keeps getting better and better. At the top we'll find the Royal Observatory, where they've got the Greenwich Meridian marked across the forecourt. Have you ever wondered what that big red ball on the roof was for? Well it's the Greenwich Time Ball. It was the one of the earliest public time signals. At 12:55 every day (unless it's too windy), the ball rises half way up the pole. At 12:58 it goes all the way to the top, and <gasp> at 13:00 it falls to the bottom of the pole again so that everyone who's watching will know the time. And way back before everyone had their own clock if you weren't paying close attention to the Time Ball, and only looked up at 13:03 ... well, that was just too bad, you'd just have to wait until the following day to have your chance of knowing exactly what time it was! Personally I think it was all a bit cuckoo: what they really needed was a very loud fog horn, with its own unique note, to announce the time, but there you go, that's mad scientists for you. Inside they have a great collection of clocks and chronometers. John Harrison's original chronometer has pride of place. Now we turn down over the other side of Observatory Hill, walking away from the Wolfe statue and the Royal Observatory, following the signs for Queen Elizabeth's Oak, which is actually an old Chestnut tree. They believe it started out in life way back in the twelfth century. So, by the time of Queen Elizabeth I, it was a magnificent specimen. Good Queen Bess is said to have enjoyed a picnic sitting in its shade. It was also a favourite with her parents. According to local legend King Henry VIII and Queen Anne Boleyn danced round the tree in the early days of their relationship when they were still happy together and infatuated with one another. They think that the tree died in the nineteenth century, but continued to stand upright, thanks to the strength of the ivy vines growing around its trunk. Sadly a terrible storm back in 1991 brought it crashing to the ground. Maybe it's not much of a spectacle, but its history always thrills me and fires my imagination every time I walk past. Now we need to keep on going and we'll come to the site of an old Romano Celtic temple. There's a great big sign, showing you how it used to look. I think this is the spot (photo below - flat, higher bit on the left hand side), but then again there isn't a whole lot of evidence on the ground. At least this is the spot they've sign-posted, but, as neither Maxi-the-wonder-dog nor I know a whole lot about Romano Celtic temples, it's entirely possible that we've photographed the wrong place. In which case this is just a photo of a pretty hill in Greenwich Park where lots of people come to walk their dogs! If we carry on walking to the park's Maze Hill gate we'll see Vanbrugh's Castle on the other side of Maze Hill Road. It's a tricky place to get a decent photograph of at this time of the year as all the foliage seems to get in the way. It was originally built by John Vanburgh the architect of Blenheim Palace and Castle Howard who also moonlighted in the theatre. It's definitely got a hint of the theatrical about it. 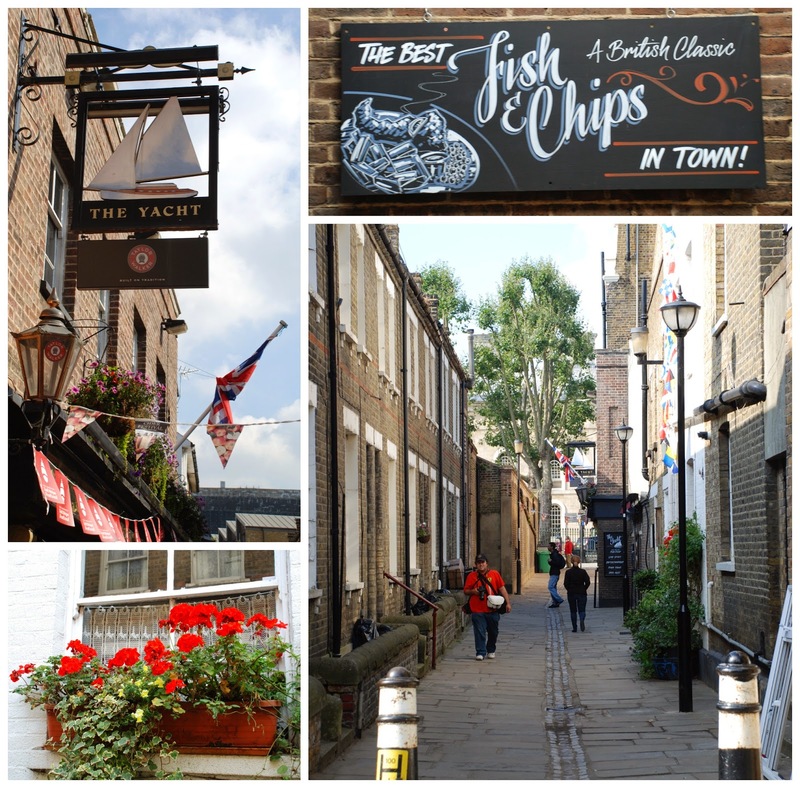 Now we need to follow the hill down to the Naval College and the Cutty Sark, or, if we have the time and the energy, there's the Fan Museum at 12 Crooms Hill. The house in which the fans live is a beautiful building dating from 1721 and is worth taking a look at for its own merit even if you've got no great interest in the fans. Lovely tour Bonny I can see I'm going to have visit Greenwich again. You've shared so much beauty! Everything looks brilliant. Ah, its been years since I've been there. Thanks so much for the trip down memory lane. That was a lot to take in but truly awesome. I enjoyed it very much. What beautiful photos, I love old buildings they have so much more character! So much beauty from the ships to the architecture!